Real Men Wear Pink gives men a leadership role in the fight against breast cancer. Community leaders around the nation use the power of pink to raise awareness and money for the American Cancer Society's breast cancer initiatives, including innovative research, patient services, and education around screenings and risk reduction. It's one important way we're attacking cancer from every angle. Real Men Wear Pink participants raise awareness and money to fight breast cancer. Of course, the top fundraiser receives an exclusive prize - and bragging rights as the #1 Real Man. The best way to learn about Real Men Wear Pink is through the stories of our candidates. Let this story inspire you and then share your own story with us. 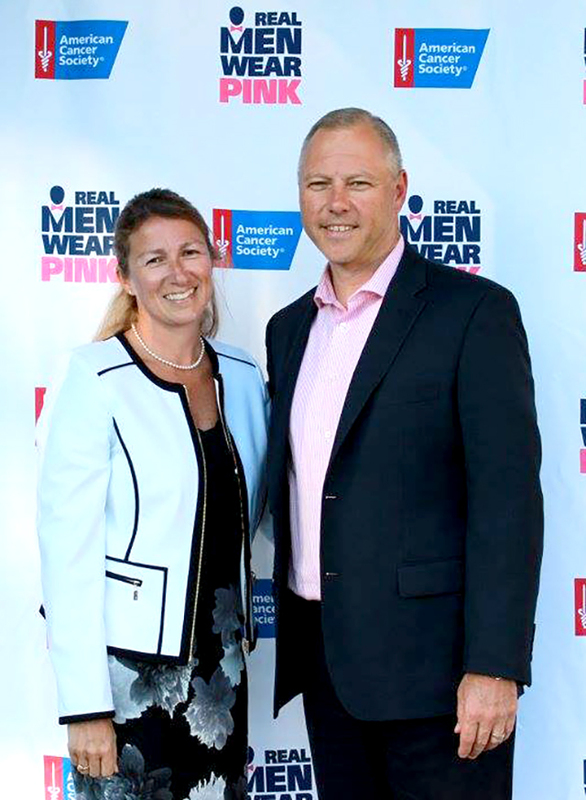 When the American Cancer Society asked Bob Noel to be one of its Maine ambassadors for the Real Men Wear Pink campaign for the second year, he didn't hesitate to say yes. The Noel family is very familiar with the impact of breast cancer, as his wife, Lynne, battled the disease six years ago. "The journey from diagnosis, treatment, and post-treatment has been one of ups and downs for not only Lynne, but also for the entire family," says Bob. "Fear, uncertainty, and doubt were a part of every day, and each family member struggled, both in silence and outwardly, to balance that reality with thoughts of a positive outcome. There was the difficulty of considering the possibility of an outcome we did not want to consider. We are grateful that Lynne currently has a clean bill of health, and at this point, our journey has enabled us to reflect on what is important and make positive changes in our lives. Our journey, however, is ongoing, and the weight of 'what if' constantly looms over us." Bob and Lynne both reached out to the American Cancer Society for help while they went through Lynne's cancer journey. Now they want to help others going through similar experiences, so they're doing all they can to raise money to support the American Cancer Society and the Real Men Wear Pink program. Bob explains, "They provided support, assistance, and comfort during a very difficult time in our lives. In addition, the American Cancer Society provided recognition to Lynne as a survivor at the Pink in the Rink event at a Portland Pirates game. I can't adequately convey the impact that event had on all of us." Bob says he appreciates that, every day, the American Cancer Society helps people take steps to reduce their risk of breast cancer or find it early, provide free information and services when and where people need it, fund groundbreaking research, and work to ensure access to mammograms for women who need them." To give back, the Noels hosted a comedy show in Portland called Comediennes Against Breast Cancer. The event included a live and silent auction with all proceeds from the night going toward supporting the American Cancer Society. Thanks to Bob Noel and the more than 2,700 other leaders across the nation for taking part in our Real Men Wear Pink program last year. Learn more about Bob's involvement and other previous Real Men candidates by viewing this video. About 268,670 new cases of invasive breast cancer will be diagnosed. About 63,960 new cases of carcinoma in situ (CIS) will be diagnosed in women (CIS is non-invasive and is the earliest form of breast cancer). If you or someone you love is concerned about developing breast cancer, has been recently diagnosed, is going through treatment, or is trying to stay well after treatment, we can help you find the answers you need. The success of the Real Men Wear Pink program depends on the creativity and commitment of our past and current Real Men candidates. We recognize these prior top candidates who went above and beyond. After all, many of the American Cancer Society's lifesaving research and patient programs wouldn't exist without the help of community leaders like these Real Men.